One of the biggest challenges faced by social activists is finding and connecting with people affected by issues they’re concerned about. Now, thanks to Facebook’s new local news section, they may find it easier to organize information on such cases, and unite people better to solve them. 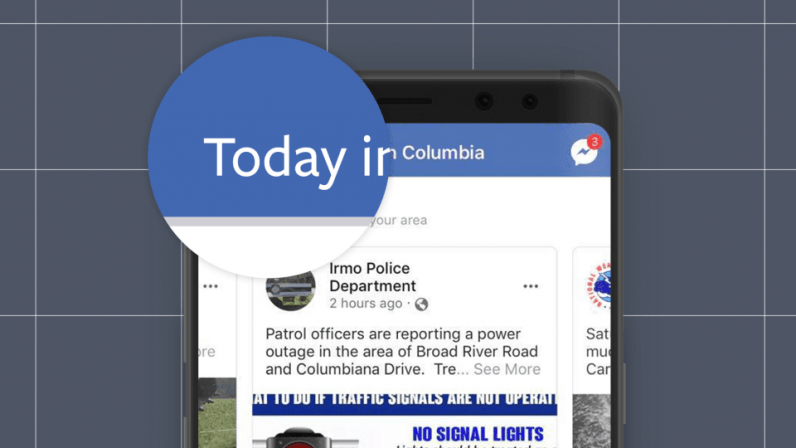 Facebook said in its blog post that it was expanding its ‘Today In’ feature – a dedicated section for local news – to 400 cities in the US, and also to some in Australia. By surfacing local news as well as posts from local Pages, Facebook is making it easier for people to know what’s going on in their area. It could also help social activists, researchers, and epidemiologists to track incidents on a far-reaching platform, and interact with people affected by or involved in these incidents. From there, they can gather more data on these issues, and mobilize efforts among the public to tackle them. One such town that has received the feature is Toms River in the American state of New Jersey. Let’s travel down memory lane and see how this community could have benefited from this feature during perhaps one of its worst periods in history. In 1997, researchers found 90 cases of childhood cancer in the city’s Dover Township, when the statistical distribution of the disease should have been only 67. But because the affected families were scattered across the town, it took years for them to realize this anomaly in childhood cancer rates, and unite to find the cause. They then found that three companies – the Ciba Specialty Chemicals Corporation, the Union Carbide Corporation and a private water utility, United Water Resources – were responsible for the breakout. They had mishandled chemical effluents and polluted the local water bodies. It took decades of effort by activists, health experts and journalists to push these companies to make amends for the calamity they had caused – a disaster story that someone could make a movie about. This is one among several stories of local communities staying in the dark, oblivious to the health, environmental, and other social injustice happening to them. Up until 2014, residents in Flint, Michigan were also unaware that their water was contributing to various illnesses. It took investigative reporter Curt Guyette of the American Civil Liberties Union to point out that the city had exceedingly high levels of lead in its drinking water. A similar case affected the hill town of Kodaikanal in southern India. It took years of efforts by activists to aggregate information on individual cases of water bourne diseases, and discover that the Indian arm of global consumer firm Unilever was polluting the town’s water bodies with mercury from its thermometer manufacturing plants. In all these cases, a tool like Facebook’s Today In could have helped people come together sooner and seek justice. While there are other social networking platforms where people can aggregate local news, they are not as widely used by local communities as Facebook – which claims to have more than 2 billion users. While Twitter already lets users network, and look for trending stories around them, the platform doesn’t reach as many users as Facebook. Facebook sought to build the new section after more than 50 percent of users it surveyed said they wanted to see more local news on their feed. The section, apart from providing local news, also displays stories on upcoming events, school announcements, and posts and conversations from location-based Groups. The social media company said that Today In shares content using the same algorithms it uses to prioritize local news over other stories in your News Feed. A Facebook spokesperson told TechCrunch that Today In uses a number of misinformation filters to ensure that fake news and clickbait do not surface on the section. The content shared on Today In would also pass through Facebook’s filters for hate speech, and other types of content that are in violation of the platform’s policies. Facebook has also teamed up with 100 local government and first responder Pages to provide a feature called Local Alerts, to issue notifications when disasters and other emergencies arise – such as information on where to seek shelter during a hurricane, or which roads are safe to take during a flood. It will be interesting to see how Faceboo’s new feature evolves over time, and who adopts and makes the best use of it. If you are interested in trying it out, you can request it for your city here.